Digital disruption is reshaping today’s business landscape with new risks and opportunities. In a world of accelerated change, organizations need new solutions for collaboration and mobility. At the same time, they face rising pressure to protect not only privacy and data but also apps and devices. Microsoft’s Cyber Defense Operations Center reports that in 2016 alone, more than 3 billion customer records were breached globally. Cyberattacks have become increasingly aggressive and sophisticated, spurring a demand for new protection strategies. 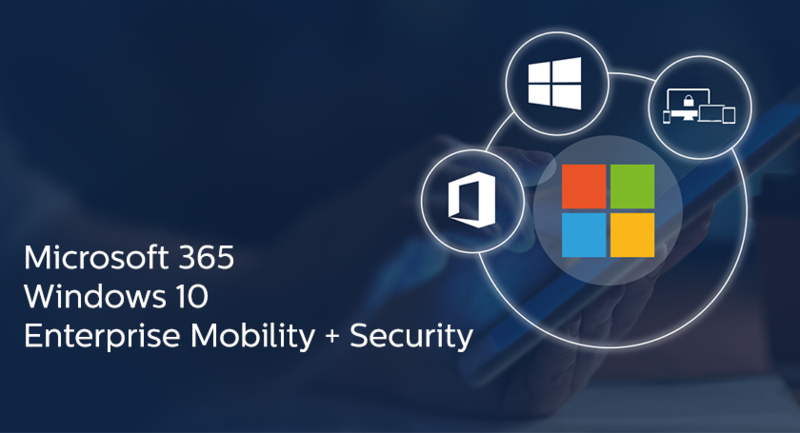 Integrating Windows 10, Office 365, and Enterprise Mobility + Security, Microsoft 365 enables secure collaboration in today’s workspace. Enterprise Mobility + Security provides a centralized way to safeguard apps and data on-premises, in the cloud, and across devices. Securely manage apps and data on iOS, Android, and Windows devices from a single portal. You can perform management tasks entirely in the cloud or on-premises through integration with System Center Configuration Manager. Protect data anywhere by streamlining identity management across your datacenter and the cloud. Identity-driven security protects your organization with secure single sign-on, multi-factor authentication, and risk-based conditional access. Gain productivity without compromise. Employees benefit from using familiar apps and a consistent experience across mobile and desktop devices. And you can extend protection from Office 365 apps to line-of-business software.